A flame of the Holy Fire has been delivered to the U.S.
A flame of the Holy Fire has been delivered to the U.S. for the first time in history, TASS reports. 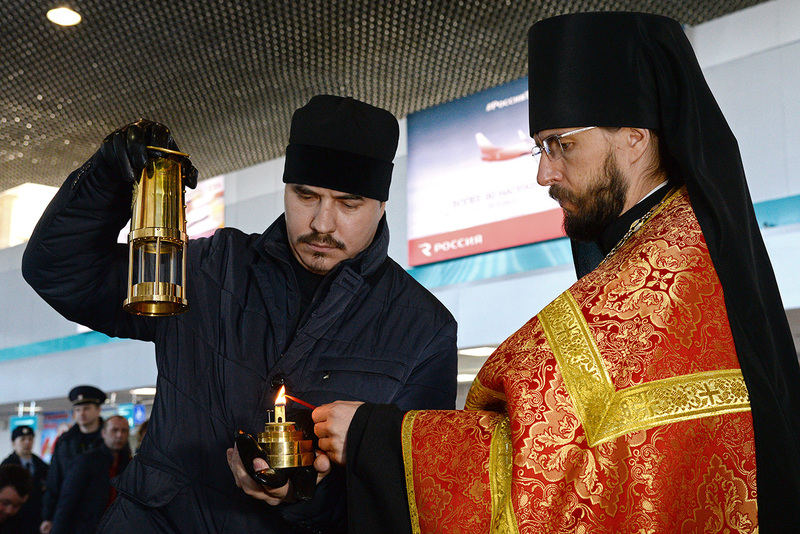 Two lamps containing the Holy Fire from the Church of the Holy Sepulchre in Jerusalem were flown from Moscow to the Big Apple on April 16. "For the first time in history the Holy Fire has been brought to America. To have it delivered by a private flight directly from Jerusalem would have been very expensive, so we decided to bring it from Moscow," Protodeacon Dionisy Lvov from the Russian Orthodox Church Outside Russia (ROCOR), said. One lamp was taken to the Church of the Icon of the Mother of God "The Inexhaustible Chalice" in Brighton Beach. Another flame was also delivered to the St. Seraphim Church on Long Island and the ROCOR Synodal Cathedral of Our Lady of the Sign in Manhattan.